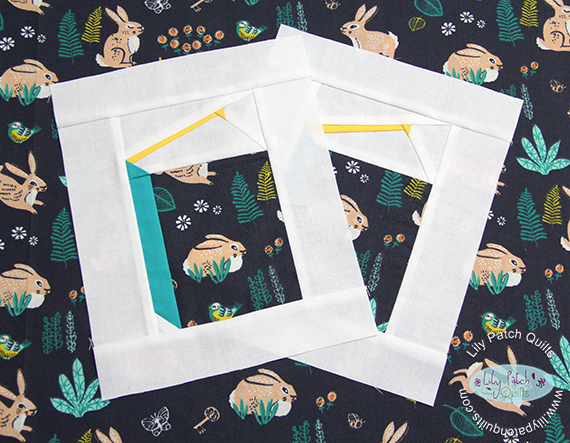 I rarely paper-piece but I couldn't help it when I saw this cute Talltales block from Kate Basti for Stash Builder Box's March Ambassador in Waiting challenge. 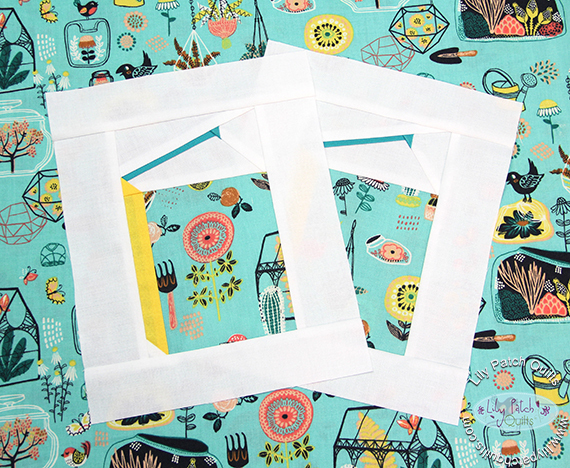 The fabrics are pretty cute and the blocks go towards making quilts for kids in need. I printed the pattern onto 24 lb. copy paper because that's all I have at home. Although the paper was thick it tore off pretty easy. I made total of four blocks, two of each print. These blocks took no time at all to make. There are some tips I would like to let you know if you would like to make these blocks. You can find the pattern here. After I finished sewing each block together minus the white borders, I did trim it down to 4.5" x 7" so that when I stitched the borders together it allowed for the points to stay sharp and not get cut off. For the side borders I cut (2) 2"x7" and (2) 2"x7.5" for the top and bottom. I also cut the main print 4.5"x 5.25 just enough to fit the pattern. The measurement wasn't clear on the finished size (unless it's just me). SBB's site says finished 6.5"x9" so I only trimmed 1/4" off the top and bottom borders to allow for the 1/4" seam allowance so the completed block would finish at the size SBB stated. The blocks posted on IG has a different size for the top and bottom borders but I like mine to be more uniformed. I sure hope these blocks fit the requirement that SBB asked. I really LOVE these fabrics. They're from Birch Fabrics and they're directional so double check the design orientation before cutting. I will have to whip up some fun accessories or something like that to use. Very cute! I'm not a fan of paper piecing. I can't get my brain to work backwards and upside down.